If you need equipment or modifications to your home, you might be able to get funding from the Ministry of Health, ACC or the Lottery Grants Board if you meet their criteria. Your GP can help you find out what you might be eligible for. Your GP might refer you to a physiotherapist or occupational therapist if they can help you. Or you may wish to pay to see a private physiotherapist or occupational therapist. Where can I get funding to pay for disability aids? The Ministry of Health will pay for a walker only if you need it to get around at home, or for access to your home. If you need one only for when you are out and about, you will have to buy it yourself. If you need a walking stick or crutches, you will also have to buy these yourself. You can get them from a pharmacy, The Warehouse, or a specialised supplier listed by Age Concern. 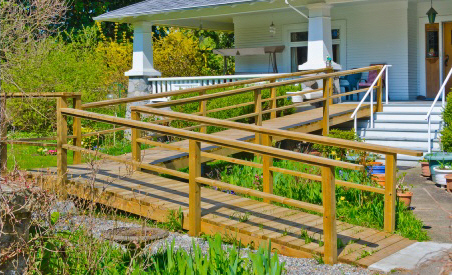 If you need simple housing modifications, such as a handrail at the entry to your house or a shower rail, contact one of the tradespeople recommended by Enable New Zealand or suppliers listed by Age Concern. You may be able to get funding for a mobility scooter from Workbridge if having a scooter means you can stay in work, get work, or do training that will lead to employment. Veteran's Affairs may be able to help with funding if you have a service-related injury or illness. Talk to your local RSA. Some people with disabilities can get lottery grants from the Lottery Grants Board. If you can't get funding from any of these sources, you will have to pay yourself. Businesses and organisations that supply disability and mobility equipment for people of all ages in Canterbury. Aspire Canterbury support all people affected by disability to access tools and resources. This leaflet lists where you can buy or hire wheelchairs, where you can get them repaired, and the malls that have them available for loan. Advice to help you rebuild or renovate in a way that lets you stay in your home for as long as possible. Slide shows explaining the different types of walkers, how to use them, and accessories you can add to help you get around. Written by HealthInfo clinical advisers. Last reviewed December 2016.